This solar turtle statue is the perfect addition for any outdoor space. The polystone construction offers a truly unique look that is sure to impress and please. 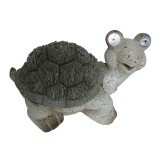 This charming statue gazes out from his home with 2 bright LED lights.